March's Mother Nature collection from The Natural Beauty Box proved once more to be popular amongst subscribers - with five full size products worth over £92, this box hit another home run! With natural and organic beauty brands like Terre Verdi, The Soul Kitchen Skincare, Douvalls, Bowe Organics, and PHB Ethical Beauty involved, this edit was full to the brim with fabulous formulas ready to "nourish your skin, from the earth." Each product included in March's The Natural Beauty Box contains minimal ingredients, and no unnecessary fillers (and with TNBB you never have to worry about nasty additives anyways!). And as always, the entire edition only contains cruelty free products that are also vegan-friendly. What more could a green goddess wish for?? 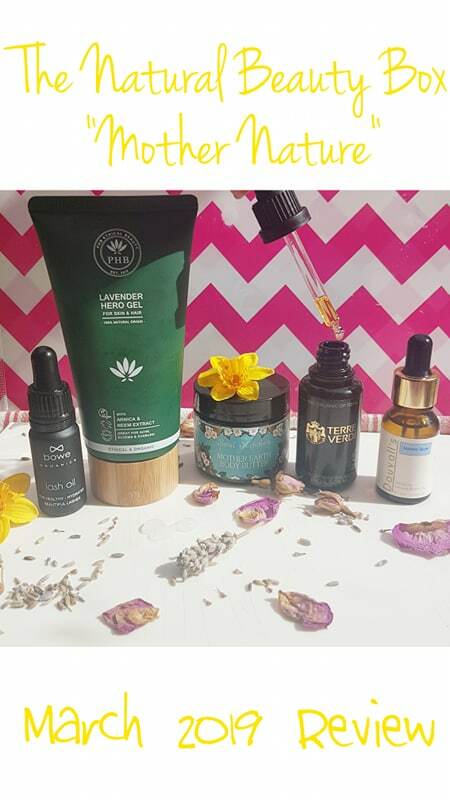 The first item to be found in the March edit of The Natural Beauty Box is from The Soul Kitchen Skincare, a small batch brand founded by Amanda, a qualified master herbalist. The artisan creations are all based on one all-encompassing tenant: kindness. Kindness to you, your skin, animals, and the environment. Now that is a mission I can get behind! 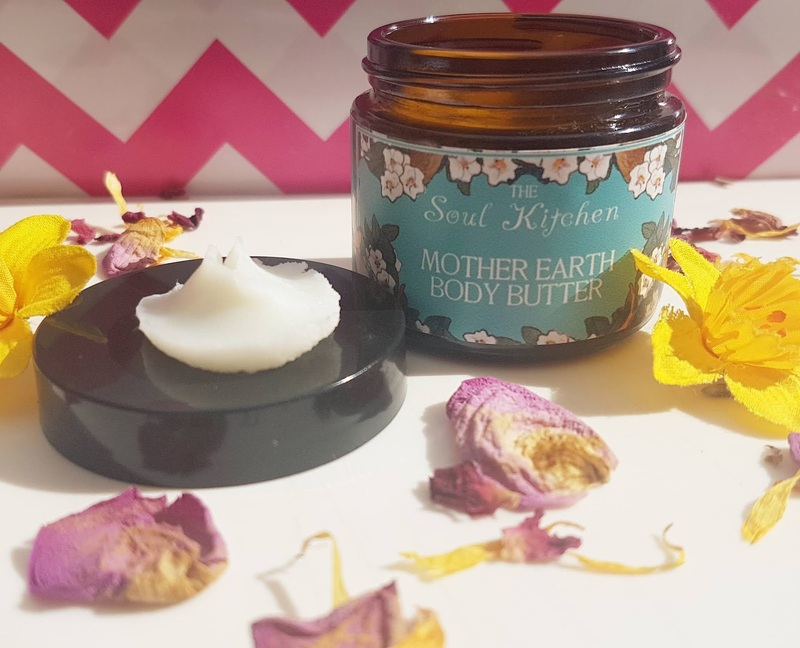 The Soul Kitchen Skincare was a new discovery for me, and I have been impressed by their super cute branding and simple but effective Mother Earth Body Butter. This product was created to improve the condition of dry, cracked skin. With warmer weather (hopefully) coming soon, this could not have come at a better time. My heels and elbows always struggle during winter, and when that transition from grey cold days to sunny afternoons comes around, those areas of my skin are always in need of tons of TLC. And with so many healing vitamins and nourishing butters and oils, I am confident even the driest bits of my body will be sorted in no time. The intention behind the formulation is "to stay calm and centred. The affirmation is ‘I connect to the beautiful grounding energy of mother earth.’" With such a pure ingredient list, The Soul Kitchen Skincare's body butter definitely delivers on this. The product itself does not have much of a smell to it, but that makes it great for those who are sensitive to strong scents or who are wanting to pair down their routine without skimping on quality or effectiveness. The butter is dense, but once warmed up the rich texture melts down and is so easy to apply. Plus, it's not heavy or greasy on the skin which is fab! I'm currently loving this for my heels and elbows, and I think it will be a go to once I start regularly wearing sandals again. It will also be a great addition into Tim's routine once his current eczema balm runs out, as I think it will be super soothing for his skin. It's always fun when a multi-tasker makes its way into these boxes, and the Mother Earth Body Butter definitely will be a versatile item in my beauty cupboard. Ingredients: Shea nut butter, mango butter, avocado oil, coconut oil, castor oil. Second up in the Mother Earth collection from The Natural Beauty Box is the lovely Lash Oil from Bowe Organics. This brand was founded by London-based Diane Bowe who stumbled into the world of natural and nontoxic formulations after beginning to use organic hair dyes while hairdressing in 2012. Since then, "she wanted to fully understand the true power of nature and all the benefits it could provide, and on the flip side, wanted to understand about all the toxic and harmful chemicals found in most products. After years of researching and trying different blends of botanical ingredients, Diane has started to create her luxury, artisan, effective brand for the world to love and cherish as much as she does." 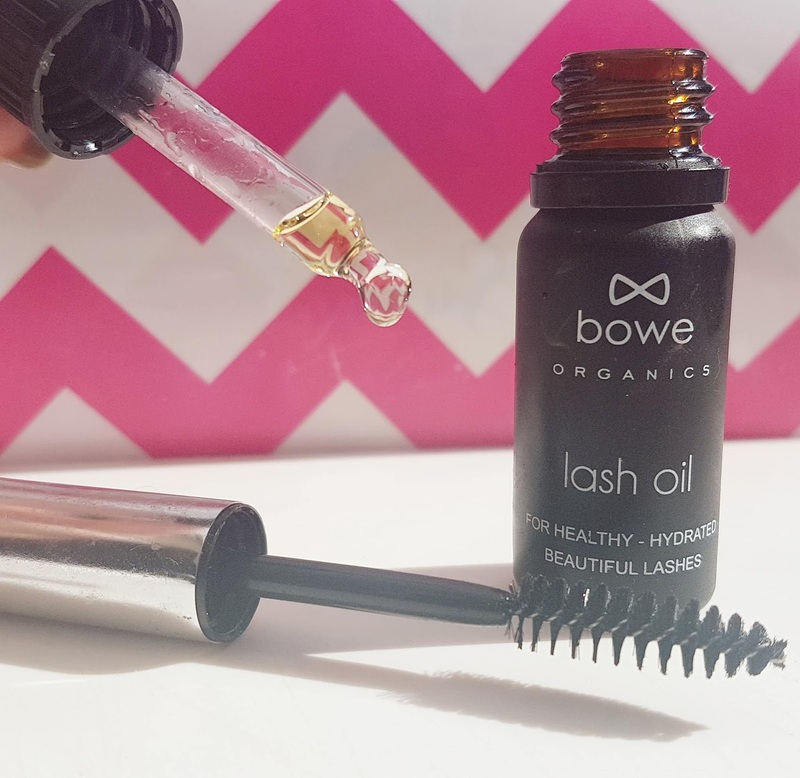 I have actually been using Bowe Organics' Lash Oil for nearly eight months now, and getting another bottle is very much welcome. The instructions say to apply the oil with your fingers, but as I felt that is a little unsanitary I repurposed an old mascara wand that I sanitized - I just put a drop or two on the wand and then apply like I would a mascara. This allows the oils to be coated onto my lashes evenly and fully so I get all the benefits! The oil actually has a pretty simple formula despite its claims of having "luxurious" ingredients. Four components make up the serum: rosehip, jojoba, castor, and vitamin E. The blend is done incredibly well though which makes this product feel more lush than you would expect. Since I started using Bowe Organics' blend, I have noticed my lashes have looked fuller. The growth has been much better, and they look so healthy and thick. I like to use this in the evenings, or if I don't want to bother with mascara but still want some definition I will pop some on before going out. While it doesn't give any pigment obviously, it does help define my natural lashes and gives my eyes a break from makeup. This is a great addition to March's collection, and I will definitely continue to use the lash oil -- it's great to have an extra bottle on hand, as now I feel I can use it even more regularly since I don't have to worry about running out anytime soon! 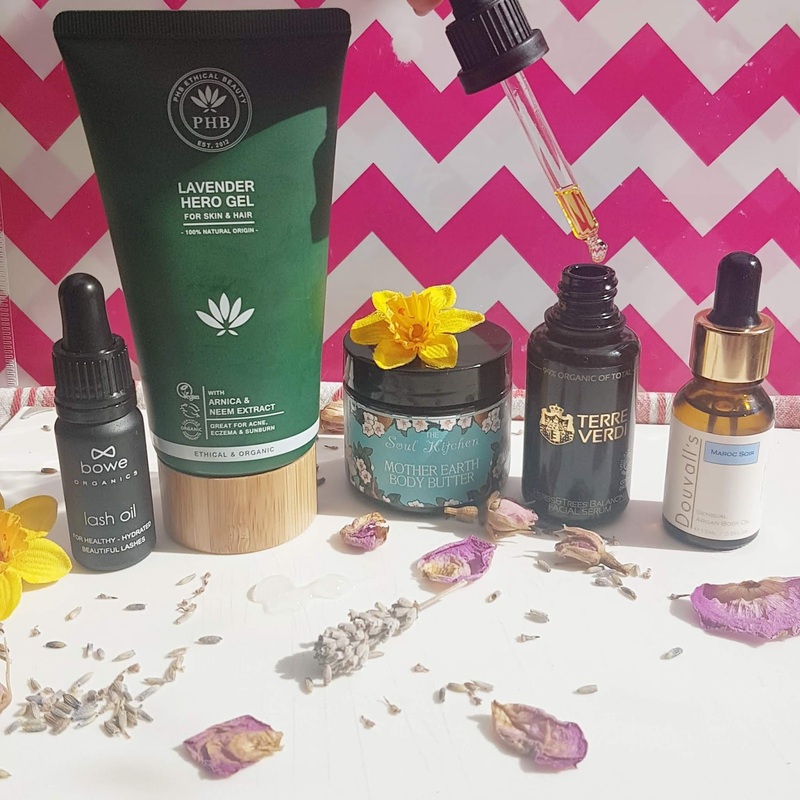 I was thrilled to find PHB inside the Mother Nature curation from The Natural Beauty Box, especially since I have been enjoying their revamped range so much over the last few months. 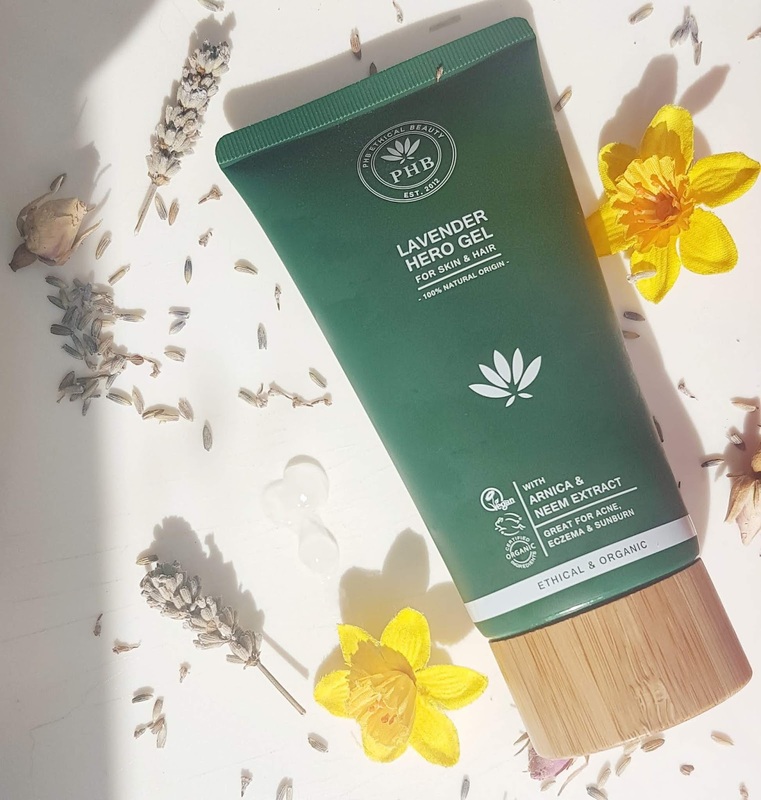 PHB is a vegan friendly beauty brand that has a massive selection to choose from, including skincare, makeup, hair products, male grooming, and more! They guarantee that all their creations are free from animal derived ingredients, cruelty, and toxic additives, plus with every purchase they donate 20% to charity -- how great is that?! Recently, a whole facelift to the packaging and formulations began, and the Lavender Hero Gel is one of the new releases introduced. This versatile gel has so many different uses, as the lightweight consistency is soothing, hydrating, and easily absorbed. It can be applied to skin or hair, making this bottle a great addition for those hoping to reduce their spending or packaging impact. In fact, this was part of PHB's goal when creating the Lavender Hero Gel. They state "For a better world: Save unnecessary packaging, product & water waste with our multi-tasking formulas." Since it can be used in so many ways, this one bottle can actually replace up to sixteen other products! "Organic Aloe Vera provides instant soothing relief to irritated skin. Lavender oil is revered worldwide for its regenerative & healing properties. Arnica extract works wonders for soothing & renewing skin following tissue distress whilst Neem helps combat dryness and discolouration. All this is delivered in our light-weight organic gel which sinks in easily to leave your skin smooth, fresh & glowing." This multi-purpose product reminds me of their previous gels in terms of texture and feel, but with that little extra something special. It's glossy and a bit wet, but it dries down quickly and does not leave any sticky residue or tacky feeling. The lavender aroma is very strong, perfect for easing tension and calming anxieties, plus it feels so cooling on the skin. I'm definitely enjoying this all-purpose gel so far, and can't wait to continue testing out all its many uses! Ingredients: Aqua, Lavendula angustifolia* (Organic Lavender Flower Water), Vegetable glycerin**, Biosaccharide Gum*, Propandiol, Salix alba, Sclerotium gum*, Lavendula angustifolia** (Organic Lavender Oil), Carrageenan (seaweed), Xanthan gum, Helianthus annuus* (Organic Sunflower) & Arnica montana* (Organic Arnica), Aloe barbadensis* (Organic Aloe Vera), Coco caprylate, Melia Azadirachta (Neem), Sodium phytate, Sodium bicarbonate. †Geraniol †Limonene, †Linalool. *Organic, **Certified Organic. †Occurs naturally in Essential Oils. Terre Verdi is a brand that won me over with the very first drop I tried of their NeroliPom Moisturizer. Not only do they craft organic skincare to perfection, but they were actually one of the first COSMOS certified brands in the UK and the first ever to register a water based moisturizer with Soil Association. Their products are all 100% natural, vegan, and certified with Leaping Bunny -- so of course I was thrilled to try another one of their green goodies! 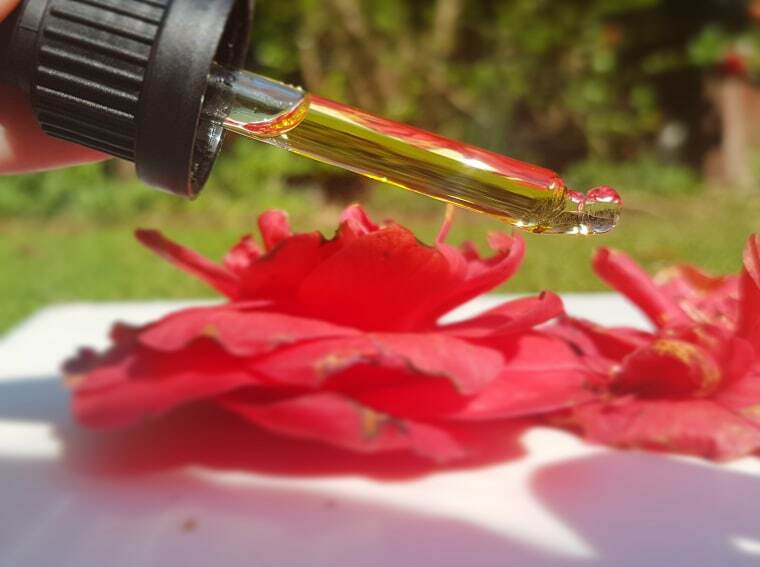 Herbs & Trees is a 99% organic oil based serum ideal for those with oily and combination skin. The formula works to balance the skin, control sebum to regulate natural oil production, and sort out trouble spots. It can also reduce dark spots over time! 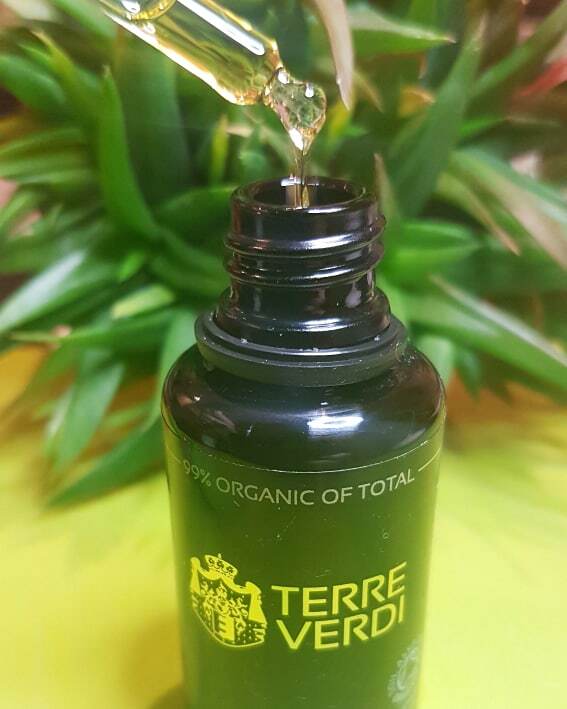 Terre Verdi states, "an acne-prone, oily skin sends you the message it needs a bit of tender, love and care. This serum will help relieve inflammation, and the astringent properties of geranium and tea tree essential oils will help bring back balance to your skin." And I have to admit, it's just what my skin was needing. I struggle with spots due to my BC (plus my skin is just fussy), and anything that can help clear up any breakouts and prevent them from happening in the first place is a huge winner in my book. This formula sinks in fully after ten seconds or so, and it is not heavy at all. While the scent wasn't initially my cup of tea, the slightly astringent aroma grew on me. The smell is pretty grounding, and it genuinely reminds me of warm rainfall in a forest - that sort of freshness that only happens when everything is fully saturated. It is comforting, crisp, and different from any of my other facial serums. It's been a joy to discover Herbs & Trees through The Natural Beauty Box, and another reminder of why I love this subscription so much. 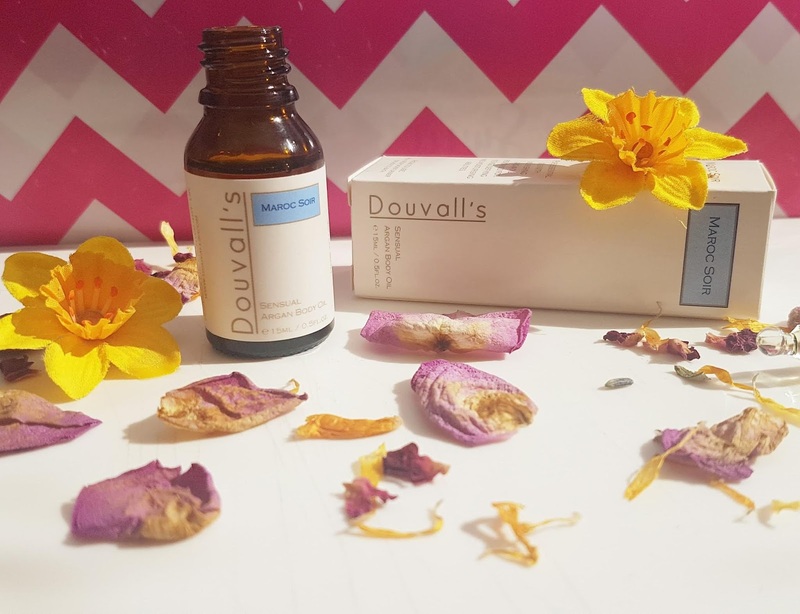 Douvalls was another new discovery for me in the Mother Nature edit for March, and one I am so happy I was introduced to. This beauty brand is a leading name in the argan oil industry, and their responsibly sourced formulas have captured the attention of those seeking classy products that also make a difference. The Maroc Soir Argan Body Oil is a fabulous multi-tasker perfect for all occasions. The oil is moisturizing, yet lightweight, and oh so dreamy. "Douvall's argan Oil is infused with sultry whispers of sensuality stirred by the beneficial natural oils of Germanium, orange and Ylang Ylang, with balsamic woody undertones for the body and bath." It's like an aromatic bouquet that enraptures the senses, and once this try me bottle is gone I will most definitely be needing to pick up another. Not only does the body oil sink in almost immediately, it has helped restore my winter-worn skin just in time for the switch in seasons. Packed with Vitamin E and essential fatty acids, this formula is a fantastic addition to my skincare routine, and I am so pleased with how well it is working for me. My skin is soft and smooth after use, and it smells so gorgeous. I've even tried using it as a hair treatment and noticed my terrible split ends didn't look quite so bad. I mean, I still need a haircut, but it definitely helps it look healthier until I can make an appointment! Ingredients: Argania Spinosa Kernel Oil*, Citrus Sinensis Peel Oil Expressed, Tocopherol, Cymbopogon Martini Oil, Helianthus Annuus Seed Oil, Pogostemon Cablin leaf Oil, Pelargonium Graveolens Flower Oil, Caning Odonata Flower Oil, Lavandula Agustifolia Oil, Limonene, Geraniol, Linalool, Citronellol, Farnesol, Benzyl Benzoate, Citral, Benzyl Salicylate, Eugenol, Iso Eugenol, Coumarin. As always, I would love to hear what each of you eco-beauties thought of the March subscription from The Natural Beauty Box-- do you have a favourite brand or product from this Mother Nature edit? Let me know either here in the comments or over in the Natural Beauty UK Facebook group! If you missed this collection (it did sell out pretty quick! ), be sure to subscribe soon so you can grab the April edit -- this box is extra special as it is the first of the new plastic free quarterly boxes, and I expect it will sell out pretty fast! The theme will be Skintritious and there are already some fantastic reveals up on The Natural Beauty Box social pages! And remember, if you are a new subscriber, you can even grab 10% off your first month by using my link here. Would love to hear if you end up joining! And now for a special treat... Remember a while back I included a little Q+A with Made By Coopers' founder Clare? 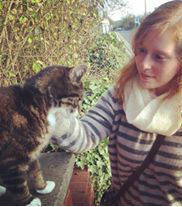 Well, I thought it was time we all got to know Emma, the amazing mind behind The Natural Beauty Box! 1] What was your initial aim for The Natural Beauty Box, and how has it changed/grown since you launched? 1. To help people find truly natural skincare products (free from harsh chemicals, skin irritants, artificial fragrances and cheap filler ingredients) that are better for their skin, their health and the environment. 2. To help promote small ethical British natural skincare and beauty brands as they are the stars of The Natural Beauty Box. These brands make absolutely gorgeous products that are super effective, smell amazing and make you feel amazing. They really make a difference to people's skin and overall wellbeing while minimizing the impact on the planet. I don't think my aims have changed much but now I'm more conscious about plastic pollution and it's devastating effects on our ocean and wildlife, so that's why I have introduced the plastic free box every quarter. This doesnt mean that the months in between will be all plastic, as I'll still be trying to minimise plastic where I can. As more brands find alternatives to plastic, I'm sure I can improve on quarterly boxes in time. 2] What are your biggest joys that come from running The Natural Beauty Box? Without a doubt, my biggest joys are: 1. Getting personal emails and messages from subscribers thanking me for curating such beautiful boxes with such gorgeous products. 2. hearing how products have helped subscribers' skin or made them feel better. 3. Hearing that subscribers have gone on to repurchase the same products or different products directly from the brands, as that's what it's all about, helping the brands grow. That really makes me happy! 3] Are there any struggles that come from running your own business? How do you manage them? Oh yes....I struggle with time - as in - there aren't enough hours in the day! I have another day job and two young boys so I have my hands full. I do a lot of my work once the boys are in bed and I sometimes squeeze a bit of time in at weekends too in between keeping the boys entertained. I enjoy the social media side of working though, posting updates and reveals etc so I don't think of that as work really. Thank goodness for mobile phones and scheduling apps too - If I had to rely on working on laptop I'd get nothing done. 4] Which products (that you discovered while creating edits for The Natural Beauty Box) have become staples in your routine? I have two products from Guiltless Skin which I use regularly - the Illume Moisture Serum, I use every day and the Clarity Face Oil is one of my regular face oils (although I like to try different ones because there are so many beautiful ones - Clarity is my go to face oil when I get hormonal monthly breakouts). I exfoliate once a week with Niskama Skincare's face polish and I also use two products from BAO regularly - the Reviving Hand and Body Cream and the Recovery Face Cream. 5] The subscription market has been booming in the last few years, with many boxes coming and going quite quickly - have you noticed any changes in how subscriptions are run since first starting, and what do you think is most important when it comes to delivering a monthly service? I have seen a big growth in subscription boxes in the last few years as it's a fantastic idea (in my opinion) to discover new products and get a well deserved monthly treat delivered in the post. It's exciting opening the box and trying out the products too! The most important factor to me is to provide exceptional customer service. This includes always ensuring the products are high quality and free from harsh chemicals, skin irritants and animal derived ingredients. I make sure the products are beautifully presented and well packed so they arrive in perfect condition while keeping packaging to a minimum. I provide as much information as I can about the products, brands and ingredients in my posts and emails, and I always get back to customers and answer questions as quickly as possible. 6] I'm a firm believer in supporting others in the field you work in, whether that is academia, marketing, blogging, beauty... Are there any small businesses or creators you want to give a shout out to or express your support for? I'd like to give a shout out to Catherine and Natural Wellness Box. I am a subscriber of her lovely box which includes natural beauty, wellness and gorgeous vegan snacks! There are too many natural skincare brands to shout out them all but a special mention has to go to Theresa from Skin Alchemists for partnering with The Natural Beauty Box three times and giving subscribers the chance to try her stunning luxurious natural products - each one, I have LOVED and has been very well received by subscribers too! A huge thank you to Emma for taking the time to answer my questions -- I loved reading your responses, and I hope everyone else will too! Great post - it looks like this box came with some awesome products! I think that body butter sounds amazing :) Thanks for sharing! Wow, what an amazing box, really good value for money! I wold love to try that serum from Terre Verdi, it would come handy when I get breakouts. I am really tempted now to get the plastic free box but I am not sure what kind of products to expect? Would Emma reveal what's in April box? For example, would it be a body butter, facial serum or something else? Thanks Bryanna! I've just checked the first three reveals and I love them! I am definitely subscribing!